Drones are useful for mapping big areas in a fast and cost-friendly manner while providing data. And here at Professional Drone Services of Texas, we believe in providing the best data possible in a cost-efficient way. That means using the latest equipment and software geared to integrate with your industry’s workflow. Before drones became popular, you would have to fly around the area with an aircraft to get a map of high resolution and accuracy, or you would need a spy-type satellite. Thanks to the advancement of drones, the development of integrated software and the overall reduction in cost, high-quality aerial maps are available for many industries. Using a drone is like having an extra set of eyes in the sky for hard-to-reach areas. Drone mapping is especially handy when you need information on areas that show changes over time. Aside from 3D mapping services for building and landscape, drones are ideal for mining sites, agricultural sites, and construction sites where you need measurements or high-resolution surveying. A satellite or plane can’t compete with a drone and aerial mapping software for generating data on demand. Drone mapping is highly helpful to the construction industry. In fact, maps are used to send regular updates to clients within this industry so they can see the growth and progress of projects, generate 3D models of different construction sites, and analyze stockpiles of materials like gravel and dirt. 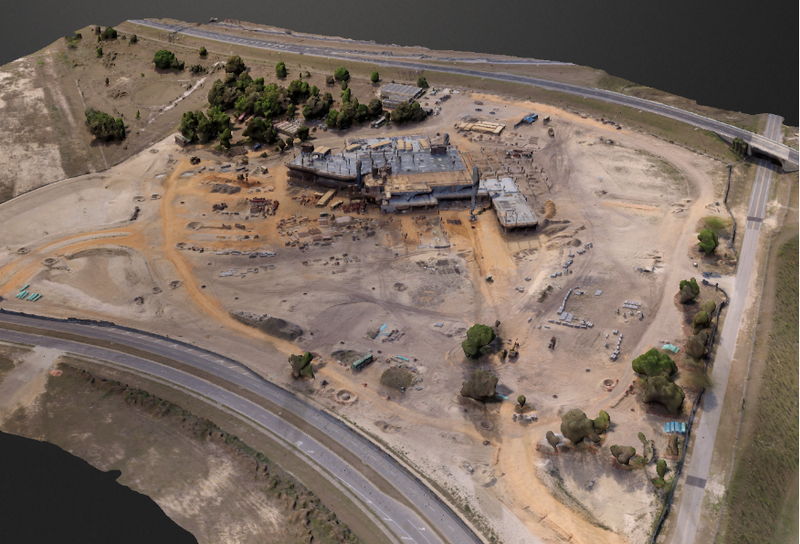 These aerial 3D building maps can help construction managers see the overall bigger picture and help with the strategic side of decision making. Anyone working with landscaping can benefit from drone 3D modeling. With landscaping, you need to take accurate measurements of a piece of land to set the proper boundaries. Data that is collected by drones can assist with map creation, legal documents and plots. Maps and plans are a critical part of a landscaper’s or surveyor’s job, so drone capability and photogrammetry – which make the whole process faster, cheaper and more accurate, are certainly helpful in this profession. For instance, with our software, someone in the landscaping and surveying field can easily turn a 2D aerial photo into a 3D topographic map showing areas with steep grades or depressions likely to flood. A topographic map is a type of map characterized by large-scale detail and quantitative representation of relief by using contour lines. They can also turn it into a 2D orthomosaic, which lacks the distortion of other maps and more accurately measures true distance. You can even turn it into a plant health map, which uses NVDI (Normalized Vegetative Difference Index), showing you areas of plant stress caused by drought, insects or disease. You can also measure volumes (helpful for bodies of water and stockpiles of materials) and points of interest along with notes for reports. Aerial maps can be useful when it comes to selling land – especially if it’s a vacant lot with not a lot of street-level visual interest or a view blocked by trees. When someone is considering buying a large area of real estate, having a recent aerial map also helps determine quality-of-life value. For instance, a potential buyer can see surrounding neighborhoods, the distance to work and amenities like shopping, schools and doctors’ offices and maybe even – in flood-prone areas like Houston – how close they are to a floodplain. With a basic satellite image, detail is usually not good quality, while drone mapping provides a clearer image. A heavily detailed aerial map allows insight into the details of the property without a client needing to be present in person. Accurate borders and contour lines can be overlaid on the imagery with the assistance of a licensed land surveyor. The mining industry has already caught on to the benefits of drone mapping. Details and recent 3D maps – which can measure volumes and topography as well as elevation, are utilized to keep track of stockpiles, dump management, erosion detection, and water drainage. Having consistently updated maps gives managers better information to make important decisions. Drone pilots mainly utilize cameras to inspect equipment visually. However, photogrammetry also helps with an inspection. Drones can assist with creating an in-depth map of a roof, along with IR sensors and RGB sensors that can detect improper insulation coverage or leaks. The energy industry can take advantage of aerial maps for inspecting solar farms and finding issues with solar panels via infrared imagery. This is the industry that can benefit the most from drone mapping. Drone-generated maps made with NVDI (Normalized Vegetative Difference Index) give farmers the power to analyze fields to provide data for decision making. With aerial mapping, those in the agriculture industry can save time, improve their bottom line, and increase crop yield. For instance, by knowing which areas of plant growth are already healthy, those practicing precision agriculture can limit watering, fertilizer, pesticide or fungal treatments only to stressed areas, thus saving time and money. Detailed drone maps can detect and track illegal logging, easily determine tree count, and accurately monitor the forest’s health. The maps can also help identify any dead trees, which can help prevent forest fires. Especially helpful are our thermal cameras, which allow us to see human and animal trespassers even in the dead of night (in fact, thermal imaging often works better at night, which is why we’re one of only a handful of Houston drone services companies to have a waiver allowing us to fly at night). Accurate and quick information is critical when a disaster happens. Using a drone for photogrammetry lets officials determine the damaged areas after a disaster such a hurricane or flood. With this data, the officials will be able to distribute resources for an effective response. Our ability to shoot thermal and standard images simultaneously helps tremendously in this area, since we don’t have to make one flight to detect an anomaly with a thermal camera and then make another flight with an RGB or standard-vision camera to confirm the anomaly. And again, our thermal cameras allow us to search at night, through a canopy of trees or in fog, smoke and other low-vision situations. Drones can also quickly reach impassable areas quickly. With the newest technology and precise techniques, 3D aerial mapping can yield extraordinary results. Prior to a drone flight to collect data for the 3D models, it’s important to think about the time of day; timing makes a world of difference. Our experts can help determine the perfect time for you. Usually around noon is ideal because the shadows are short, and the sun is directly overhead. Scheduling too early or even too late in the day could impact the precision of your model. Thermal imaging, meanwhile, often works best at night, when a range of temperatures (like those of humans and animals) can be differentiated from the more-chilly night air. That’s why Professional Drone Services of Texas is one of only a handful of drone service companies in Houston and surrounding cities to have a special waiver to fly at night. Nadir images are the first ones captured with a drone while doing 3D aerial mapping. These images are taken when the drone is looking down on the building or terrain from directly above. The images form a baseline of the 3D models. Your objective is to gain a 3D view of a terrain or building, so viewing it from above will not always give the perspective you want. If you’re looking at a flat area of terrain, you can usually get by with just nadir images. If you want to model a terrain or facility with differing altitudes, you will need to add oblique images. Once we have captured all the images from several angels, we will then use aerial mapping software to take images and stitch them together in a 3D representation of the terrain or building we were scanning. With applications in construction, landscaping, real estate, agriculture, mining, inspection, forestry and emergency management, drone mapping is helpful for a wide range of industries. Aerial 3D mapping technology gives a clearer image than satellites at a significantly lower cost than mapping with an aircraft. It’s especially useful for hard-to-reach areas, or areas that change over time. A drone can generate detailed information on demand that can help you make important decisions, no matter what industry you’re in.